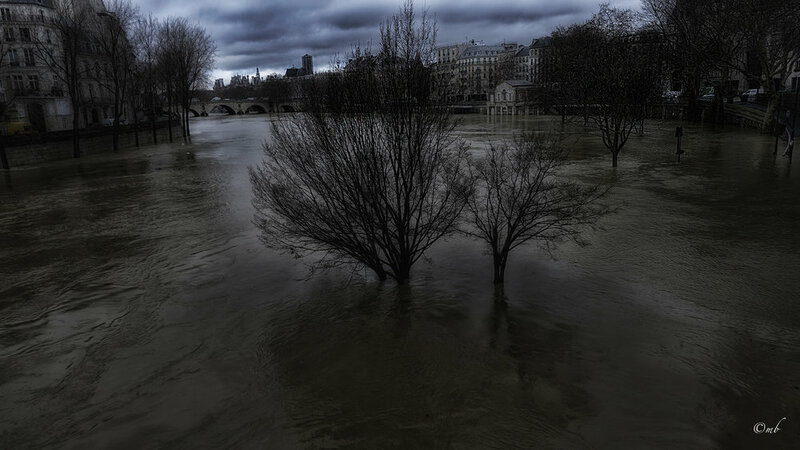 This week the river Seine in Paris is rising and flooding very dramatically. . .perhaps an antidote to the “drought” in the title of my newest book. . .or merely a very stark reminder of the world that engulfs us, in its drama and in its harsh beauty, yet and still. From a recent journey to Naples, in Italy. . .I stood beside a sculpture by the South African artist, William Kentridge titled Il Cavalieri di Toledo, a reference to the colonialism of the Spanish invasion of Naples. . .But it made me think as well of Quixote and his fierce spirit as he traveled on his broken down steed. . .and the battling of the windmills, and how that is also a part of the poet’s life. Fighting the realities and the illusions, to stay alive, and to keep writing. The upstairs room at Shakespeare and Company where I love to hide away and write. Reading one of my own poems in my window facing the courtyard. 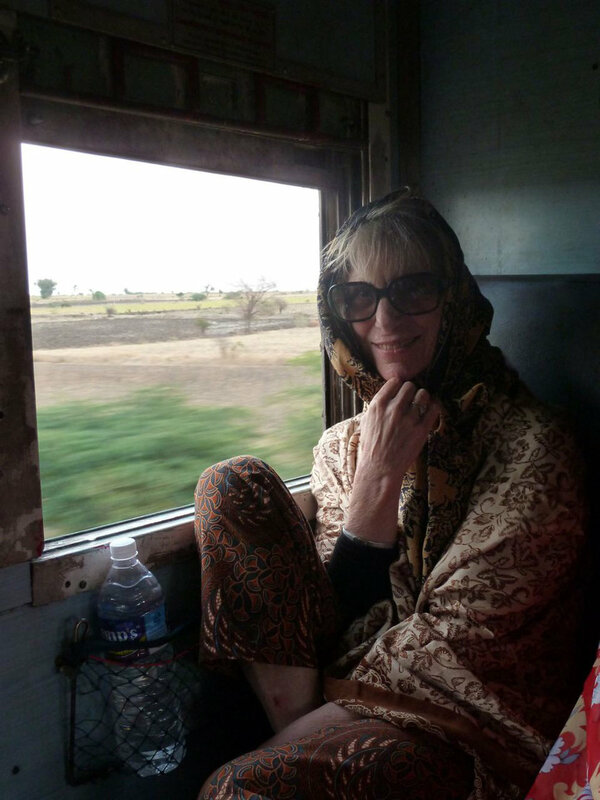 On a long train trip in India. I wrote for hours and hours on that train. 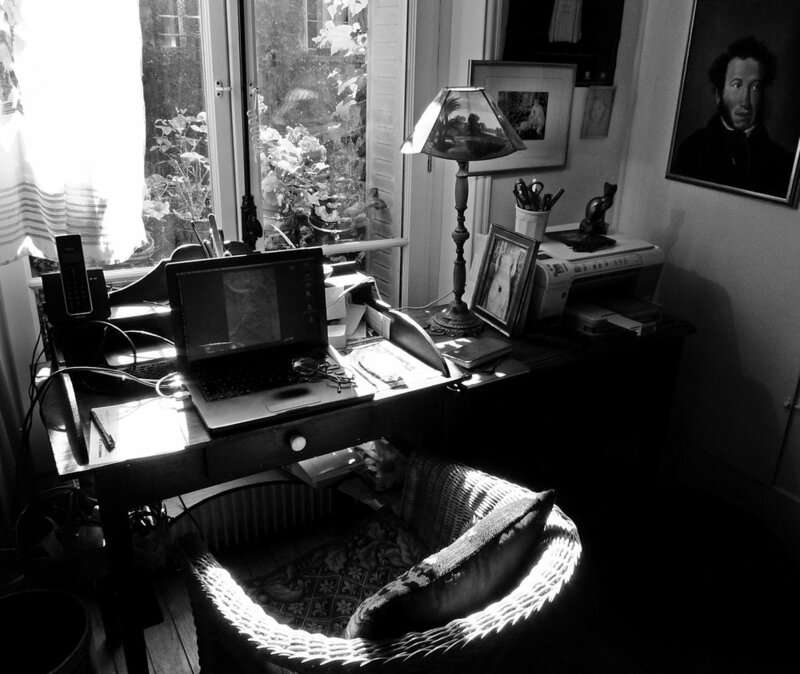 My writing desk in Paris. My crowded writing desk at dawn by candlelight. What is your most recent writing project or what is a piece you’ve had published recently? My most recent book was published by Glass Lyre Press in September 2017: Before the Drought. What’s your favorite thing someone else has said about your writing? It’s been a very good year for wonderful things said. I’m grateful for all of these comments. What is one craft or writing book you love? I love to recommend this one: Writing For Your Life by Deena Metzger. Who is one other writer you’re excited about right now? Quintan Ana Wikswo. I’ve just recently discovered her. Her writing and photography are brilliant. We have recently interviewed one another [at Full Stop]. What’s the worst piece of writing advice you’ve ever gotten? What’s the best? Worst: An editor who had signed a contract with me for a poetic novel then said I should cut the book by 50% and remove all of the philosophoical and meditative sections. Result: I broke the contract. Best: A poet (Faye Kicknowsway) once inscribed her book to me with these words: “The words sing all the time. Break open their disguises.” I’ve treasured that advice ever since. Do you have a dedicated work space? Do you write in your home or do you prefer to write elsewhere? Can you write while traveling? What are some of your writing habits? I’m really not a creature of habit, but I do aim to write every day. At least in my spirit. It may be by candlelight with my first coffee (Light comes late in winter time where I live, and the candle helps me to believe in the light.) But it may also come while I am walking and stop to fill a notebook page. I also am rather dyslexic, so often my work begins with lines that I think are the start. . .and realize eventually that they are to be the ending. For me it’s a matter of trusting process rather than habit. And also, being willing to begin again and again and again, and not to be frightened of the silent times, the empty times, because there are such times for me. But I trust that the words can and do return. Also, I have two creative modes; I’m also a photographer. So times when words desert me, I open my eyes to images and allow them—to speak to me, and for for me. When you are sitting down to write, what is the first thing you do? I need to get silent. I try sometimes to listen for my own heartbeat. When in your life have you felt your work/life balance to be most in sync? When in your life have you felt the most out of sync? I used to tell myself that I could write best when I was happy, whatever that means. (Happy.) But I know that to be an illusion. Both the notion that I write best when I’m at peace and content, and the notion that I can possibly control when such a time is, or will come. The truth is that much of my best work has come out of my inner sense of being lost, or too alone, or feeling that I had to speak out or choke, or when the need and hope of being a voice in my time makes any other thought seem selfish, and I just allow. Also, as I have matured as a human, I deceive myself less as to what I need to write—and I just do the work. What are the most pressing demands for your time, energy, labor (including emotional labor)? What has worked best for you in terms of balancing those demands with writing? When a book is published, I feel overwhelmed by the demands to do the dog and pony show for it, and the need to work for “it.” To get the word out for it. To help with publicizing it. To query. Too often, to plead for notice for the book. Something I don’t enjoy, to be honest, but the reality of publishing is that the poet must collaborate with her press in this, or the book will not reach the readers she and it most desire. Because once published, the book is a living thing and I feel I owe it my best shots. When I am in this mode, I find it nearly impossible to write new works. I surrender to this, but the emotional price is huge. What are the ideal conditions for your creativity? A small whisper somewhere inside that says “trust yourself. . .it will come.” And then, patience. Enormous patience and a humility that comes from having written well, sometimes, and having written pages that only deserve to be burned. . .but knowing that I have found my way in the dark before, and I will again. I don’t know where such faith comes from. But I have known it, and known it to disappear, and known it to return. So I must call it a faith in my own faith. Do you have any writing rituals? Or any non-writing rituals that feed your writing life? A very old friend, the science fiction writer Theodore Sturgeon used to speak of the need for a writer to spend “window time.” I understood that he meant allowing oneself to stare into space, to stare out the windows. For me, sometimes I stare into the dawn—and wait for the light. And sometimes I need to sit very quietly in the dark. And allow. And wait. What self-care practices do you have and what, if any, routines do you have surrounding them? How does self-care relate to your writing life? Long showers. Making good coffee. Long walks. Forests. Making love. When I would go on walks at my last place of employment, I often passed this garden. I called this my Alice Walker Garden. Victor LaValle describing one of my characters as petty will remain with me for a long time, if not forever. I’m going to give you three. I've found some good guidance in Jewell Parker Rhodes’ Free Within Ourselves: Fiction Lessons For Black Authors and Stacey D’Erasmo’s Art of Intimacy. Rhodes’ book is a fundamentals book that I’ve learned a lot of craft language from. It also places writing within the context of living a life so it’s motivational in that way. D’Erasmo’s book is more like a philosophical exploration of how writers write intimacy. As someone who often writes familial relationships, it’s helpful to see the tropes we get caught up in. I'm reading Dionne Brand and Edward P. Jones right now. Writers who I've previously read and excite me in different ways. I'm enjoying the experience of reading A Map to the Door of No Return and All Aunt Hagar’s Children at the same time because I can carry one idea from one book and try to explore it in the other. For instance. they are both working with ideas around how black people carry history with them but Edward P Jones’ style really gets into the everydayness of life so it’s especially interesting to consider how one carries history at this very intimate level. I don't know if I've received very bad writing advice. I think everything produces a learning experience. I will say a recurring conversation that turns me off is the idea that fiction writers give a lot of time to projects and that investment doesn’t guarantee anything (read: publication, especially with fanfare). I understand it but it's discouraging. I think if we really pay attention to the process, we see there are all sorts of nourishment. The best advice: read craft books. Do you have a dedicated work space? Do you write in your home or do you prefer to write elsewhere? I do write at home. It's not my favorite thing though, particularly because my home is very small: living space is dining space is sleeping space is study space, etc. It can feel cluttered and overwhelming. If I’m on a daytime writing schedule, I might go to the public library or, if I have money to spend, a coffee shop with good lighting. I don't work on my writing projects daily but on writing days, I do set a time goal. So maybe two hours of writing or a combination of reading and writing over four consecutive hours. The exception is when I’m writing the first draft. I try to use momentum to get to the story's ending. When I don’t have many daytime commitments, I write late at night and into the morning. I prefer dark and quiet, not just for writing but also for taking care of household things. It seems my body/mind wakes up around 9 p.m. I almost always turn on Alice Coltrane. I always do a short breath focused meditation to shift out of whatever mindset I needed for my previous tasks and into one for writing. How do you pay the bills/financially support yourself? I have no income right now so my savings account plus familial support plus social services like Medicaid and the public library system are my support. I think my life is my work so it’s really hard to balance resting/taking care of myself/enjoying life with doing my work. I do a lot of unpaid work (programming art events and discussions). I love the work but I’m on a hiatus because I wasn’t balancing things well but also because I think a retreat or hibernation phase of making is necessary. I don’t want to be producing just to keep up with some arbitrary standard or because it feels like everyone else is producing. Maintaining my household, my wellbeing, my relationships with family and friends, and being present in community (especially for the sake of my work) are all demanding. I have a personality that swings from being overwhelmed to being exhausted by (too many) people. I’m over 30 and managing a chronic illness that causes fatigue. I play around a lot less with my time. It’s my main resource. It’s a practice to not give it away to just anything or anyone. In the same way, I set goals for how much time I give my writing, I set up plans for these other demands. Like, I’m going to invest some time in this particular relationship or I’m going to these three events this month, or I’m going to clean for 15 minutes, and I’m going to be okay with staying at home, resting and not working. I think we all know the ways solitude is necessary for artmaking. What’s been interesting is how community has been critical for my creativity. It’s fairly easy to generate ideas but it’s easy to feel stuck when too isolated. I’ve had breakthroughs during workshop, while talking with other writers, and while listening to artists talk about their work. I think having a meditation practice has helped many aspects of my life and since everything is interconnected, my writing practice has benefited from me having healthier relationships, improved self-esteem, etc. My self-care practices include: journaling, detaching from my digital attachments, walking, meditating, and asking my body what it needs (and getting answer like: to pee, to eat some greens or some root veggies, etc.). I hope that my writing, as I do with all of my work, contributes to resisting the dominant culture (white supremacy, patriarchy, capitalism). What I’ve learned is this isn’t possible without some self-care and self-actualization. bell hooks’ Sisters of the Yam is one of my favorite reference materials for this but also the older women I’ve met who do community work or political organizing. Like witnessing the ways these women live their values and care for themselves and other people was critical in my transition to adulthood. Nina N. Yeboah was born to Ghanaian parents in Alexandria, Louisiana and raised in Stone Mountain, GA. She is a reader, prose writer, and cultural worker. She was the 2016 Voices Rising Fellow at Vermont Studio Center, a 2016-2017 FIELD/WORK resident at the Chicago Artists Coalition and is an alum of the Callaloo Creative Writing Workshop and the Hurston/Wright Writers Week. In 2017, she was a finalist for the Guild Literary Complex Leon Forrest Prose Awards in the category of nonfiction. Research books on the study desk. Writing in local coffee shop. Typewriter and painting my father bought because it reminded him of me always hidden behind a book. What is your most recent writing project, or what is a piece you’ve had published recently? My third collection of poems, Sometimes We’re All Living in a Foreign Country, came out with Carnegie Mellon University Press in October of 2017. These were inspiring words from a poet who I so deeply respect and admire, and they also meant so much to me at a time when I hadn’t yet had a book accepted and when I was having trouble believing that someday I would. Hacker’s words were the encouragement I needed then, and I turn to them now when I’m feeling discouraged about making this particular project about my family history the book I dream it can be. I love Mary Ruefle’s Madness, Rack, and Honey, and also another one of my favorites for teaching graduate students is Natasha Sajé’s wonderful Windows and Doors from the University of Michigan Press’s Poets on Poetry Series. There are so many, so I will focus on a poet whose book I’m looking forward to: I loved Sally Wen Mao’s Mad Honey Symposium, and I can’t wait to see what her new book from Graywolf will be like next year. The worst: Being told I was too young to write about what I was writing about. My students, no matter where I teach, always remind me that young writers can amaze and surprise you. I try to never restrict what they can write about. We just moved, last summer, into the downstairs apartment of an old house, and I’ve built a nice little writing spot in the corner of the dining room. When I was living in Mississippi, I came across a wooden desk that had been in the old Tennessee House of Representatives. I now have it tucked under a window next to some weird built-in bookshelves that block an old doorway out of the dining room. The upstairs neighbor’s stairwell is on the other side of the shelves, and his beautiful aging golden retriever sleeps on the steps and snores all day. It is soothing and hilarious to hear her snoring on the other side of the shelves while I’m writing. The truth is, I am used to writing poems outside of the house because for most of my writing life I was only able to afford a tiny studio apartment or a room in a house and so I have always sought out clear and quiet places to work. My past favorite writing spots have included The Writers’ Room of Boston, where I was lucky enough to have two fellowships; a tiny white windowless carrel I rented for fifty bucks a semester at the University of Southern Mississippi’s library; and the beautiful reading room at Harvard’s main library. And many a coffee shop! I’m still searching for my next spot. Academic jobs: For the last two years I was the Jacob Ziskind Poet-in-Residence at Brandeis University, and in the spring semester of 2019, I’ll be the Distinguished Visiting Writer at Bowling Green State University. I often read through other recent drafts of new poems and begin to fiddle with them and then I either get lost in the revision or move on to starting something new. What are the most pressing demands for your time, energy, labor (including emotional labor)? One of the most pressing demands outside of my academic jobs has always been my literary magazine, Memorious.org, which I’ve been running, and selecting all of the poetry for, for nearly fifteen years since I co-founded it in 2004; it keeps me busy. (I also handle all of our social media, which is time consuming!) And being a good citizen and support person to fellow writers–-whether friends or students or former classmates or whoever else gets sent my way–-can take a lot of my time and energy. But one thing I know: we writers need one another. I love residencies. I love having a space that is only for writing, and I get so much inspiration from the conversations with artists and composers and writers that residency communities offer. My last book, The Spokes of Venus, was born in part from those conversations. But having a space that’s just for writing, whether a space of my own or a really wonderful library to work in, does the trick as well. This question makes me want to create some elaborate writing rituals! Someday, when I have the time. 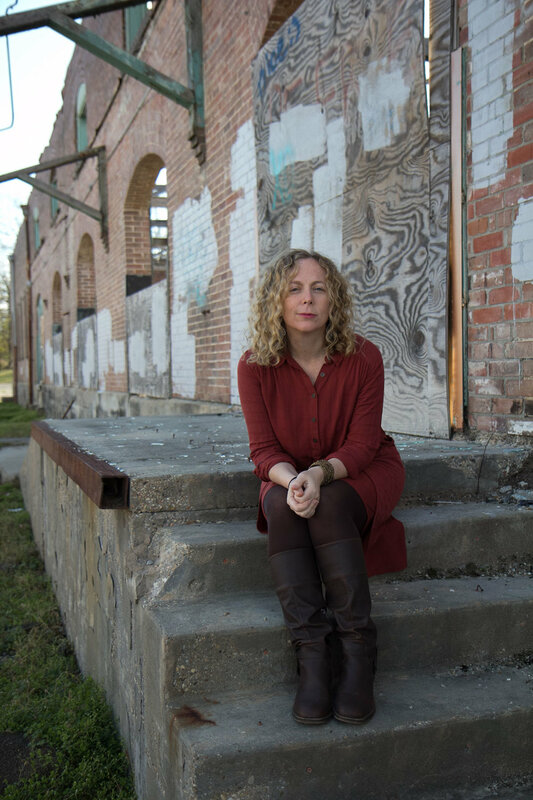 Rebecca Morgan Frank is the author of three collections of poetry: Sometimes We’re All Living in a Foreign Country (Carnegie Mellon 2017); The Spokes of Venus (Carnegie Mellon 2016); and Little Murders Everywhere, shortlisted for the Kate Tufts Discovery Award. Her poems have appeared such places as the New Yorker, American Poetry Review, Ploughshares, Guernica, and the Harvard Review. She is the co-founder and editor-in-chief of the online literary magazine Memorious.org. In Spring 2019 she will be the Distinguished Visiting Writer at Bowling Green State University. The typical state of my desk, and representation of how external environment mirrors internal environment. Plants at varying stages of decay (representative of recent emotional turbulence). My book, Bridled, was published by Pleiades Press in February 2018. Maybe nontraditional, but I love Ways of Seeing by John Berger. Jenny Xie’s book, Eye Level published by Graywolf Press in April 2018 and Ben Purkert’s For the Love of Endings, published in March 2018 by Four Way Books. During my MFA I went to a professor who almost exclusively wrote formal poetry. I wanted to have a gritty discussion with him about the craft of formal poetry. Instead of engaging me in discussion, he told me students should generally avoid writing formal poetry because it had to be much better quality than free verse or experimental poetry and was more difficult overall. I ultimately never shared any poetry with this instructor. I think my problem is less with space than with time. 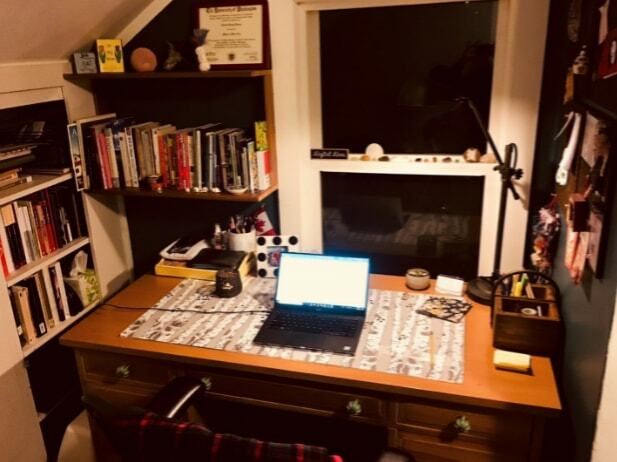 Though I generally need to be somewhere other than my room to write, (I particularly recommend Paragraph: Workspace for Writers for NYC/Brooklyn writers) it doesn’t matter where I am if I haven’t done a good job setting aside time for writing. I need to schedule realistic amounts of time (e.g. not 8pm on Friday nights after a quick happy hour). I like to write at Paragraph for a few hours immediately after my 9 to 5 when I can. I have no habits. I would benefit from habits. I write in little spurts and then don’t write for months — sometimes over a year—at a time. To be fair, I do nest-build during that time: I keep notes in my phone of ideas, lines, or images that come to me. I turn on my computer. I almost always write on my laptop and feel great about it. I divested from writing as a career, partly because I have a lot of financial anxiety and partly because writing while working in any career that depended on the goodwill of the literary community seemed like an enormous conflict of interest. Now, I work as a Project Manager at an education technology startup. I’m bad at transitions. When I first begin a job, a relationship, a move, I take months and months to settle into a new routine. I’m bad at imposing structure and habit on my personal life, so when new elements are introduced I flounder indefinitely until I’ve broken enough things that I begin to triage my life and impose structure. That’s usually when I re-balance my work/life. I divide most of my time between my 9 to 5 work, romantic relationship, and guilt. I think it’s useful to define what I want each of these relationships to look like: How important is work to me? What kind of relationship do I want with my partner? What else do I miss the most? Once I gain clarity on these boundaries, it’s much easier to know how to prioritize and say no to certain things. My therapist says guilt is usually an unhelpful tax I exact from myself, so I try to listen to her. I like sound that I don’t have to listen to. Playing one song on repeat, or instrumental music (I like Max Richter), or noisli.com is great. Dim lighting and small spaces also help—basically whatever conditions are ideal for a snail are my ideal writing conditions. I also really like the Pomodoro technique and just purchased my second paid app ever: Forest. It’s an app that plants little digital trees whenever you go a stretch of time without breaking focus (with bonus of using your credits to plant real trees). No, but I’m trying to develop this—I want to train myself to start writing whenever I hear smell burning sandalwood or something. Self-care (or the lack of it) is a huge part of my writing life. When I’m in poor emotional or mental health, I don’t write. Usually when I stop writing it’s the first red flag that I’m about to drop into a depressive spiral. I’m looking into medication that’s compatible with existing meds I take for a chronic pain condition, but so far I don’t have a way to guarantee that I will be consistently well-adjusted and capable of writing / doing laundry / answering my emails on time. Amy Meng holds degrees from Rutgers University and New York University. She is the author of Bridled (Pleiades Press, 2018) and a Kundiman Fellow. 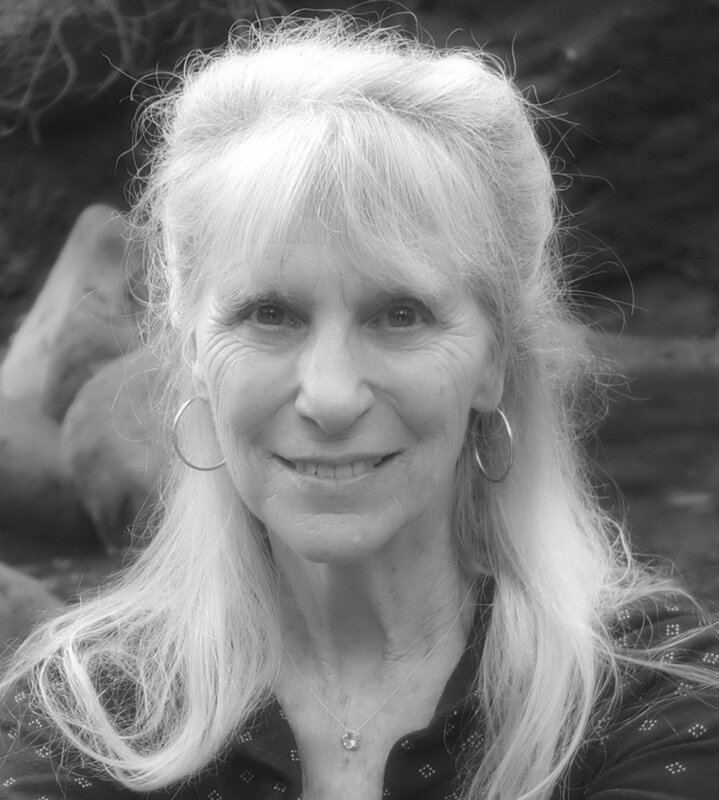 Her poetry has appeared in publications including: Gulf Coast, Indiana Review, New England Review, and Narrative Magazine. She currently lives in Brooklyn. What is your most recent writing project, or, what is a piece you’ve had published recently? Recently, the Nashwaak Review published a nonfiction story I wrote about my short stay in Wadi Rum, Jordan’s desert. Mostly I write fiction now, so this piece was unusual from that perspective but also because I travel a lot and almost never write about my trips for publication. And my first novella, The Finest Supermarket in Kabul, was launched January 31, 2018. I always have writing projects on the go! My current list includes research for my next book, a novel with parallel narratives about a family separated in Germany’s WWII; a short story about a film camera in three distinct time periods, and another one set in Toronto’s art scene in the 1980s. A good friend messaged me this comment: Holy f**k! I’m only on page 30 and I’m in love with your writing. . . sweet and human as well as smart and to-the-point! At the moment, I’m reading Big Magic by Elizabeth Gilbert. A few friends recommended it as a good writing tool. 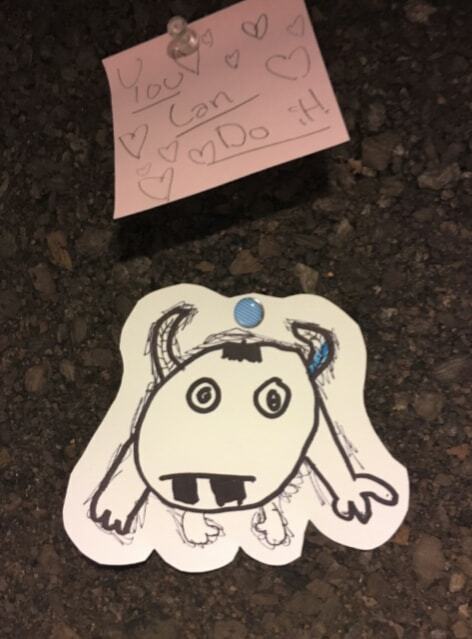 While it’s not exactly that, it is an amazing vote of confidence and pick-me-up for artists doubting the success or viability of their work in the public realm. I skirted Eat, Pray, Love after flipping through the first few chapters, but this book is lovely in its informality and enthusiasm for just putting it out there--like talking to a good friend or partner when belief in a new or on-going project is waning or dead. I’m about to get into two technical books, The Art of Description: World into Word and The Emotion Thesaurus. I came across Lydia Davis when reading a New York Times article and loved Can’t and Won’t. I think micro stories don't get the love they deserve. I write flash fiction for an annual chapbook my writing group puts together, so I know how hard it is to “write short.” In fact, the shorter the story, the more difficult it is to satisfyingly cover all plot points. My blog stories are modeled after this style. The worst piece of writing advice I ever received was to turn a short story with an experimental introduction into a screenplay. Instead, I standardized the first paragraph and liberally edited until I was happy with my narrative. The best advice was for characters to use all their senses when describing surroundings. Now when I write, I make a note: ‘see; smell; hear; touch; taste’ and lay it beside my laptop as a reminder for my characters to engage all or as many senses as possible. No dedicated work space, I write mostly from my couch. There is a desk in my house, but my partner claimed dibs as soon as we bought it. And it’s become a mini man-cave covered in his film photography stuff. But that’s okay since writing is something I do at night and I prefer to be comfortable when being creative. Other than short blog posts, I’ve found it impossible to produce substantive writing while on the road anywhere. My biggest need while writing is WiFi because I like to see what a character or narrator is describing so it can be as accurate as possible. I google all kinds of images and flip back and forth as I’m writing. I tend to write in the evenings, and sometimes on weekend afternoons. I would love to write every day, but it’s tricky with a full-time job and other time-consuming obligations. A friend wisely told me not to wait for inspiration to write, but to treat writing like any other job or task. I’m doing that more and more now and find I can write quick snippets here and there that will be ironed out in the editing anyway. When you are sitting down to write what is the first thing you do? Craft a title I like. Arguably this can take a while, and will often change as the story unfolds. But I can't write without one. Before I became an author, I found an awesome partner (for that story see Single and dating in my 40s: It's no fairytale) and we both have full-time jobs. I also teach a college course, which is great because it means that money is plentiful. Yet, as I gain more writing successes, I’m craving more writing time even though I’m not ready to reinvent my work choices. When I left my international development career and moved home to Toronto, I didn’t have a job. As I was exploring options, I joined Moosemeat Writing Group to feed my artistic side, but also to meet new people. Success on both counts and for the next few years there was more writing/life than work, which while stressful, but also gave me space to write the beginning chapters of The Finest Supermarket in Kabul. To transition to a new career, I opted to go back to school for a masters. During this year there was more work than writing/life and my manuscript did not get much love. I started working full-time directly afterwards and picked my draft back up once I’d settled in. Now I’m well balanced, although I do sometimes contemplate setting the alarm for 5 a.m. so I can increase my writing time. Mind you, that doesn’t work well since I'm not a morning person. I find my most pressing demands are connected to activities I’m involved in beyond writing and work--I curl twice a week and help organize teams; I’m president of my condo board; I have a standing trivia game with friends; and I teach a course at a local college. More than a full plate. To get in some writing (beyond the highly unlikely 5 a.m. start), I give myself small word goals and focus on finishing scenes. Ideal conditions for creativity are coffee, an image of the scene I’m creating, silence and perhaps a view outside of weather conditions that make me want to stay indoors. I know an 85-year-old with boy trouble. Nothing good ever starts with please. No crazy people bothered me today because they think I’m one of them. One very specific self-care practice is running, either at the gym or in High Park near my condo. I’ve always enjoyed the exhilaration of a good run, but will also use this time to work through sticky plot points. Sometimes I’ve found myself writing and quickly changing gears to head out for a run if I’m stuck in a story. For more than a decade, Ele Paweleski has managed human rights projects in Kabul, Afghanistan and other danger-pay-locales. Now living in urban Toronto with her husband, she is always planning for her next travel adventure. Her stories have appeared in magazines, journals and newspapers. The Finest Supermarket in Kabul is her first novella. My first book, California Calling: A Self-Interrogation, (Hawthorne Books) released on March 1, 2018. Everything about writing a book is hard, but getting book blurbs was, for me, particularly fraught. When it came time to ask authors I admired and had learned from, my imposter syndrome kicked in. Like, who am I to ask for their time and attention, let alone their support? But you have to proceed. I was honored to get wonderful, perceptive blurbs, and it turned out that these were also some of the first outsiders (people beyond my inner circle) who saw my book. So their responses to it were hugely validating. In particular, a writer I have been in awe of for a long time, Abigail Thomas, said, “The delicate architecture of this book is stunning, and the originality of Ms. Singer’s voice and mind is as exciting as anything I’ve read in years.” Abigail’s memoir Safekeeping was literally by my side the entire time I worked on my book. Her formal tactics—telescoping point of view, breaking traditional prose rules, flip-flopping tenses, fragmented language that glints with awareness—have enabled me to push boundaries in my own work. 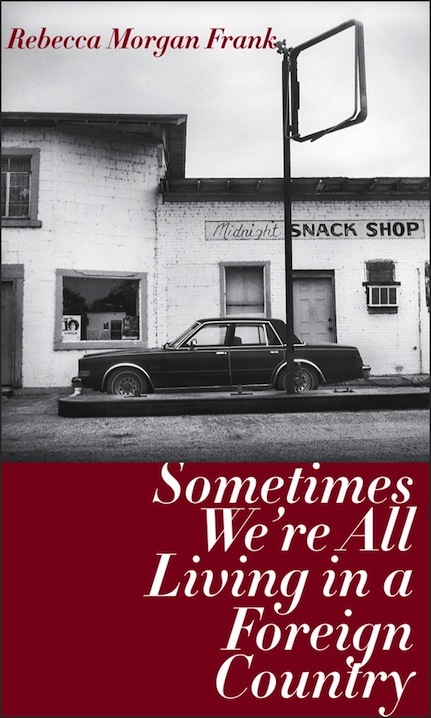 I can tell you a writer whose work I am most anticipating now (and always am): poet and essayist Lia Purpura. When I first read two of Lia’s essay collections—On Looking (2006) and Rough Likeness (2012), I felt the ground shift under me. Lia shows with her craft what is possible with the form. Her short, poetic vignettes thrum like self-contained worlds unto themselves. You read a Lia essay and time decelerates; it’s the literary version of a meditation. I haven’t ever met Lia but I’m kind of like a shameless teenage fangirl. She has a new essay collection, All the Fierce Tethers (Sarabande Books), coming out in early 2019, and I can’t wait for it. Worst: Never start a sentence with ‘and.’ Never write fragments. Never use clichés (I feel like you get a once-every-five-years cliché allotment, but you’d better know what you’re doing and why you’re doing it). Best: My friend Theo Nestor, a writing teacher and author of the memoir-and-how-to book Writing Is My Drink, once talked to a writing class I took about special clubs. She said that we’re all members of certain special clubs—we all have inside knowledge of certain worlds, spaces, groups, and experiences. She told us, they’re all important—write about those. At the time, this gave me the confidence that I did in fact have the authority to write about some things. I can write anywhere—this is a mother skill developed out of necessity—but as I’ve gotten older it’s gotten harder to get focus unless I’m in the right space (or maybe this is just procrastination!). I just recently created an office, which is really a third of a guest room and which I’m calling my writing cabin—that feels aspirational and Pinterest-y to me, which is strangely and sort of embarrassingly exciting. I painted the corner a foresty teal, put my desk in front of a window, and filled the space with items that are important to me and books that I feel I am in an ongoing conversation with. Before that, for the past eight years or so, I wrote everywhere—coffee shops, soccer practices, my bed, the car, the bathtub. 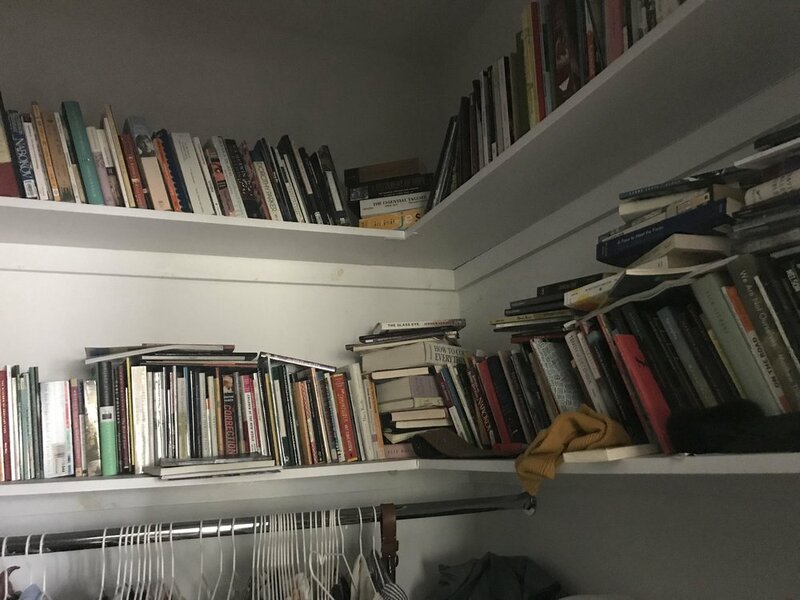 When I finally made the writing cabin, I kept wandering into the space repeating the words, “I can’t believe I didn’t do this before,” over and over again. The cabin definitely makes me want to write. I also find I’m very productive when I travel to write. A few times a year I do a writing retreat—either a getaway with writer friends or a writing conference out of town. The act of carving out a block of days just for writing really energizes me and is very freeing. I’m not going to answer this because I feel like I should have a much more respectable, structured set of habits and, well. . . I currently work as a managing editor for a corporate client; before that I was the managing editor of a magazine. On the upside, I have financial security and get to use some of my creative skills and journalism background in interesting ways. On the downside, it’s tricky to splice time and mental energy and to make sure I continue to push my art forward. Ironically, I feel the most “balanced”—which for me means stimulated and engaged, but not necessarily at ease—when I am juggling the most. I entered an MFA program late, at 37. I went to night classes, worked on a thesis, parented my two young daughters, and worked full time at my day job. I was exhausted, but, creatively, it was one of the most fruitful periods of my life and I felt incredibly alert to the possibilities around my own art. I am still coasting off that energy. My need to write and my commitment to my family are in constant tension. It’s not a negative tension, though it can sometimes cause frustration. For me, the more something becomes difficult to reach, the more I want it. And so when the demands of mothering cut into the space I want for writing, instead of allowing that tension to prevent me from creating, I try to use it to feed my work. Aside from my crazy MFA years, the other most productive period for me creatively was immediately after I gave birth, especially to my first daughter. Time for myself became the rarest currency, and so I learned to hustle for it like I had never hustled before. I wrote poems while my daughters breastfed endlessly; I plotted out stories at 3 a.m. when my hyper-aware mother clock wouldn’t allow me to sleep; later, I scribbled a sentence or two as a toddler struggled to pull on a rain boot. Time opened up in cracks, and I filled them. With motherhood, writer’s block evaporated—it’s a luxury I don’t have. Still, sometimes my own creative work loses out. Even now as I try to answer these questions with intelligent-seeming answers, there’s a 12-year-old repeatedly asking if I will watch her PowerPoint presentation on the güiña cat. Not being asked to watch presentations on the güiña cat. I’m not sure if it’s a ritual, but I’m a perpetual notetaker. I don’t journal, because I tend to recoil from rules and regulations, and the imperative to fill out your journal every day scares me. But I take a lot of notes, about questions that bother me, about obsessions that haunt me, about things I read and ideas I have for essays or stories. I’m trying to become better about self-care now that I’m out of the fog of mothering very young children—there were years when I virtually ignored myself (mothers will understand this). I have a hard time clearing my mind, but I go to yoga and try to just be still a few times a week. Intellectually I know this is important for my health and because it brings new ideas into my awareness; emotionally, it’s hard because being alone with myself makes me feel lonely. My new commitment is to use nice face oil and try to get regular facials. How does that help my writing? I don’t know, but it seems important. 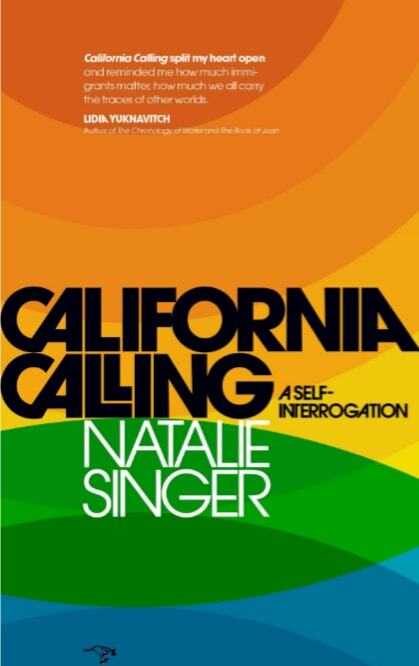 Natalie Singer is the author of the memoir California Calling: A Self-Interrogation (Hawthorne Books, March 2018). Her writing has been published or is forthcoming in journals, magazines, and newspapers including Proximity, Literary Mama, the Washington Post, the Seattle Times, ParentMap, Alligator Juniper, Brain, Child and Full Grown People. 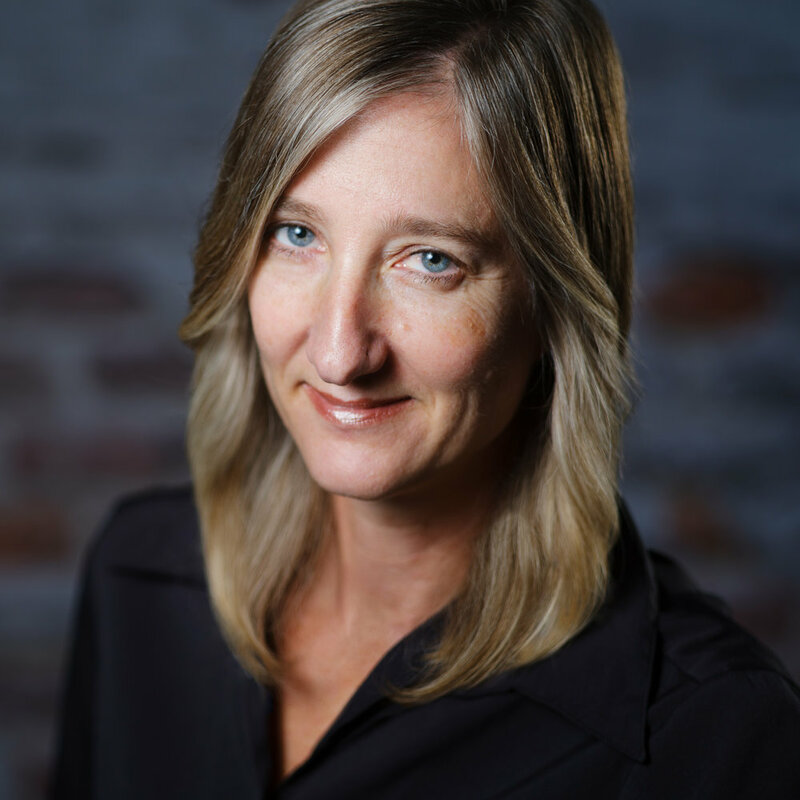 She has taught writing inside Washington State’s psychiatric facility for youth and Seattle’s juvenile detention center, and she has worked as a reporter at newspapers around the West. Natalie earned her MFA in Creative Writing and Poetics from the University of Washington. Originally from Montreal, she lives in Seattle.